Cerisi has been established since 1970s. 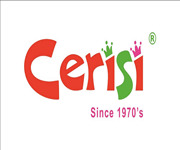 Cerisi is well known for its quality merchandise and caters for infant to age 12 (for both boys and girls). Cerisi is registered locally and in 8 other countries including Brunei, Malaysia, Thailand, Indonesia, Australia, Hong Kong, China and United Arab Emirates. Cerisi had opened up to 10 chain stores and widely distributed to major departmental stores. Cerisi has been awarded Singapore's Promising Brand in year 2002.